Truffle Bar is a wine bar and gourmet restaurant concept featuring a truffle-inspired, European-style menu. The brand is a balance between an imaginative, experimental mystique, and high-end, Old World elegance. Much of my inspiration came from considering the ecological origins of the truffle, as well as researching its rich history and mythology. Many people understand truffles as a indulgent display of luxury-- "absurdly priced mushrooms”-- something people shave on top of a dish to raise its selling price. 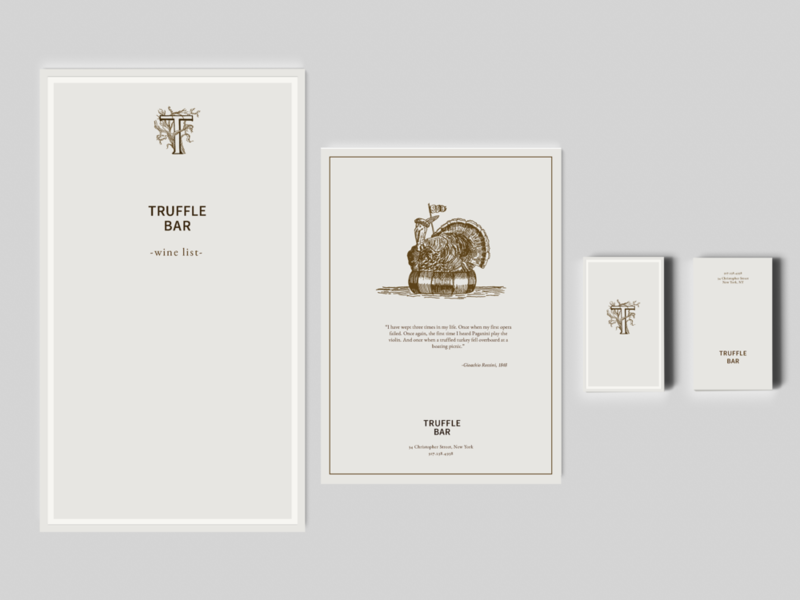 Truffle Bar brings the truffle back to its origins – nature. The brand draws inspiration from the truffle’s ecological roots – its rare origins in the wild – as well as its rich history and cultural mystique behind truffles. The best truffles in the world are still foraged in the wild and not cultivated, growing at the roots of oak and birch trees. 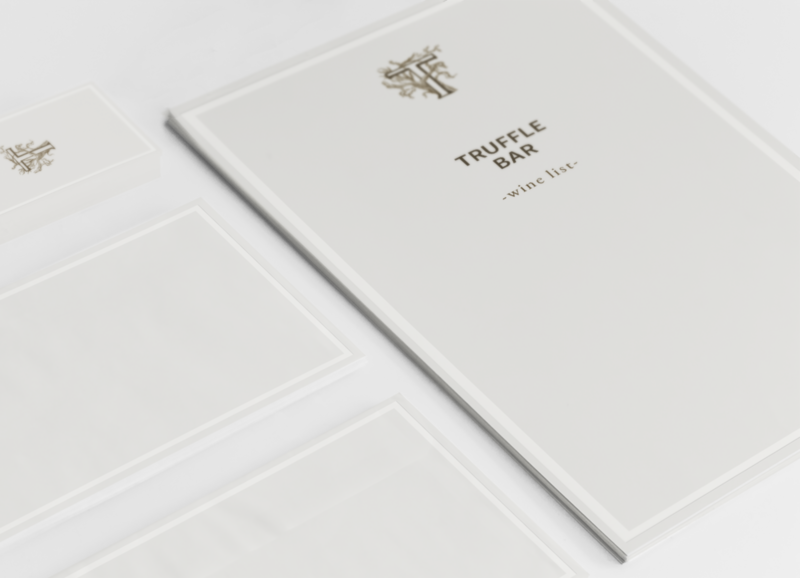 The target audience for the Truffle Bar is urban, well educated with a refined sense of taste in all things. They don’t necessarily frequent fine dining, but will easily splurge for special experiences. They pay special attention to the visual and sensory experience of dining, and are always seeking delightful, imaginative new experiences. Adjectives that describe the brand: Natural, wild, ecologically balanced, Old World inspired, Imaginative, Mystique, Grounded, Earthy. I started by doing a lot of research on truffles - understanding their history, origins, and myths. Visually, I was really inspired by a two thematic threads: elegant, Old-World mystique, and botanical/nature-inspired design. For the visual elements, I settled on a simple Sans Serif typeface to counterbalance the elaborate tree drawing for the symbol. I was inspired by the visual image of a sprawling tree because traditionally, truffles grow beneath birch and oak trees. "I have only wept three times in my life: the first time when my earliest opera failed, the second time when, with a boating party, a truffled turkey fell into the water, and the third time when I first heard Paganini play." I wanted to pair the guest-cards with a visually sumptuous illustration. For this Rossini quote, I drew a turkey in a lifesaver ring, wielding an SOS flag. I have some ideas for other guest-card concepts, which I'll be doing at a later date.